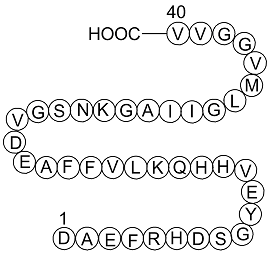 Description Aβ40 is a peptide processed from the amyloid precursor protein (APP). Aβ (1–40) reversibly increased IBa evoked at +20 mV. This increase was observed for 6 of 11 cells and reached 1.74±0.06. The activation curve showed that Aβ (1–40) caused an apparent voltage-dependent increase in IBa, with an enhancement of IBa at the test potentials between 0 and +30 mV. A statistically significant decrease in basal ACh release (-30%) was detected one week after the injection of Aβ (1-40). 30 days after the Aβ (1-40) peptide injection, the decrease in Ach release was still statistically significant (-38%). K+-stimulated ACh release was similarly affected by the treatment. Aβ (1–40) treatment induced a significant decrease in the stimulated release on day 14 after lesioning (-43%). Amyloid β-Peptide (1-40) (human), (C194H295N53O58S1), a peptide with the sequence H2N-DAEFRHDSGYEVHHQKLVFFAEDVGSNKGAIIGLMVGGVVIA-OH, MW= 4329.8. Amyloid beta (Aβ or Abeta) is a peptide of 36–43 amino acids that is processed from the Amyloid precursor protein. 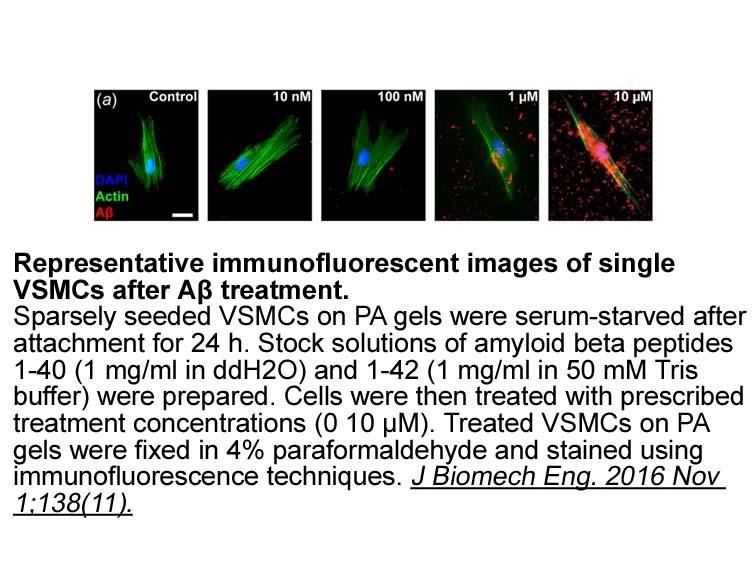 While best known as a component of amyloid plaques in association with Alzheimer's disease, evidence has been found that Aβ is a highly multifunctional peptide with significant non-pathological activity(1). Aβ is the main component of deposits found in the brains of patients with Alzheimer's disease. Brain Aβ is elevated in patients with sporadic Alzheimer’s disease. Aβ is the main constituent of brain parenchymal and vascular amyloid, it contributes to cerebrovascular lesions and is neurotoxic(2). Aβ protein is generated by successive action of the β and γ secretases. 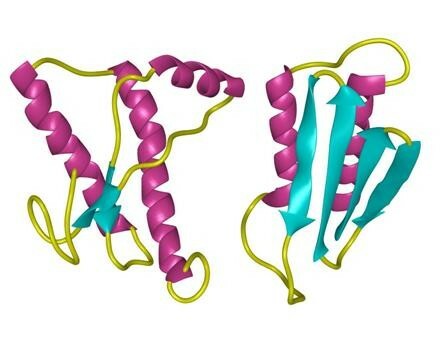 The γ secretase, which produces the C-terminal end of the Aβ peptide, cleaves within the transmembrane region of APP and can generate a number of isoforms of 36-43 amino acid residues in length. The most common isoforms are Aβ40 and Aβ42; the longer form is typically produced by cleavage that occurs in the endoplasmic reticulum, while the shorter form is produced by cleavage in the trans-Golgi network(3).